Thank you all so much for your charming messages and I am sorry to have given you cause for concern dear reader. The absence of blogging as been due to some creative time - quiet and healing. The return to my desk was then overwhelming and as I still am struggling greatly with paperwork – even the smallest of forms is defeating my written hand at present – so I decided to ration my time spent even thinking about words and get on with some of those irksome chores of the real world. I have also been made redundant from my position of chief navigator, journey planner and captive nag arse – a sat nav has been purchased. I am still reeling from the consequences of this. I now have to put up with some robotic voice telling me where I should be going as well as “him the driver”. I am sure this is not quite how it is supposed to work – but we have had some interesting journeys recently along roads we didn’t even know existed and ended up in destinations which are equally bizarre!! I am doing a U-turn at an appropriate location and looking for the sky – I always do what I am told – even if it is by a blinkin sat nav – who knows she may be right !! 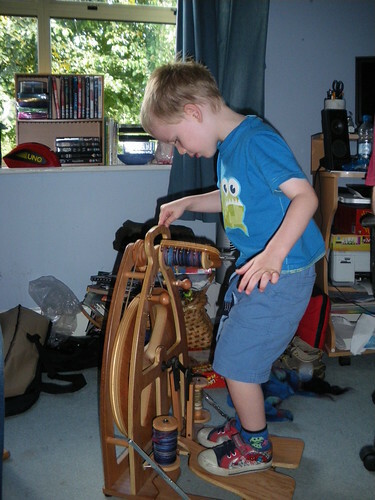 In the meantime, another use has been found for my spinning wheel….. If I could just find one big enough for me – perhaps I could lose weight after all !!! Thank you dear Tom for leading the way….